Keyword targeting can make all the difference revenue wise when working on SEO for an affiliate site that relies on SEO as its primary marketing method. You have vanity terms, traffic terms, and then you have your “money” terms. Seeing results from SEO takes a lot of work and a lot of time. So how do you go about ensuring that you focus your efforts on the keywords that will bring you the most ROI from the gate? Especially in the age of not provided? When I'm doing SEO consulting, I'm typically doing so directly for a merchant or service provider. As such, we have access to a lot of data – even in the not provided era – to help us make educated decisions in regards to keyword targeting. You can look at historical keyword conversion data for a merchant assuming they were tracking that information before not provided. You can use the data in regards to organic keyword conversions from Bing. This data is definitely valuable information, but it might not always be an accurate correlation depending on your industry as the engines have different demographics. You can use the data from Google search PPC campaigns since they're still passing keyword data to advertisers (while there is a discrepancy in user behavior between organic and paid this is still your most accurate bet IMHO). But what if you're not doing SEO for a client? What if you're doing it as an affiliate where you don't have access to the above for affiliate products and services you're promoting? How can you best position yourself to target the money keywords in the organic search results without a ton of trial and error? Affiliates have been flying blind in this regard for a long time. It's rare that an affiliate took the time and budget to build a system to assign SID codes based on organic search referral keywords to track affiliate sales down to specific organic referral keywords. Affiliates that market solely or primarily with SEO have long had to rely on alternate methods of identifying “money keywords” and while those alternates aren't always perfect nor 100% accurate, they do have value – especially in cases where the “best methods” listed above aren't a viable option. Looking at the PPC efforts of competitors (and merchants where affiliates are concerned) can tell you a lot about which terms you should be targeting. I've mentioned before that I'm a fan of SEMRush. Let's say I'm an affiliate for a merchant like TracFone. I'll take their domain and run it through SEMRush and head into the “Ad Keywords” section. Once there, you'll see there is a column labeled CPC. The CPC is what SEMRush estimates the merchant is paying per click to receive traffic from each of these keywords. Assuming you're dealing with a merchant that is running a successful PPC program (which isn't always the case) then you can somewhat assume that the keywords they're paying the highest CPC for are the ones that convert the best for them. I'll export the list of ad keywords into Excel, remove any duplicates (beware, this does occur) and sort them by CPC from highest to lowest. In this case, the export contains 2500+ keywords. I'll pare that down to the top 200. Then I'll sort the list again by the Search Volume column from highest to lowest and cut another 100 keywords. After that, I'll sort the list alphabetically by keyword. I'll go through each keyword – removing those not applicable to me for whatever reason and stripping the columns I don't need (like their “visible URL”) until I have a nice and clean list of 100 keywords that have a cross between both a high estimated CPC and a high search volume. In this case, I'd remove keywords like “how to track a phone call” etc. After doing so for this example, I'm down to 77 keywords. In cases where I don't have access to more reliable data (like historical keyword conversion data or current PPC conversion data), this makes for a much more “educated guess” in regards to a starting point than one based on estimated keyword volume alone, IMHO. But what if your competitors are bigger sites? Meaning unlike in the TracFone example above, they target multiple keywords and niches that would make using the above method like finding a needle in a haystack (think Amazon or JC Penny for example)? Let's say you're a futon retailer and JC Penny is one of your big competitors. You do a search in Google for “futons” and copy the display URL (not the “actual” URL – the one they show in their ad) that JC Penny is using in their ads (in this case it's http://www.jcpenney.com/Futons) for that term. You can enter that specific URL into the SEMRush search box, and you'll get back an “Ads Report” for that specific display URL (in this case, SEMRush reports there are 300+ keywords being bid on using that display URL). I know there are other tools that can fulfill the above functions (like SpyFu – you can read my full review on SpyFu here) – SEMRush merely happens to be my tool of choice in that regard. You can also use the same method in regards to keywords driving your competitor's organic traffic (SEMRush lists the estimated CPC of paid campaigns for those terms), but my preference is to look at the keywords they're bidding on vs. the ones that they may not intentionally rank for as a starting point. This method isn't just insight for affiliates either. What if your client wasn't tracking conversions? What if they're entering a new market? What if they don't rank well in Bing? What if they're not running PPC campaigns (and don't want to)? The above can give you another slice of insight in regards to helping you form your SEO strategy. What’s more important? ‘Viral Sustainability’, SEO, or just creating value? With all the SEO strategies and techniques changing so fast, is it not just better to create value and keep things natural? You’ll have to define what you mean by “viral sustainability” to me for me to comment on that one. :) Re SEO and creating value, I think both are really important. I think you can succeed with either of those two alone, but to exceed, you’d need both. I’ve seen amazing sites hit for technical SEO issues plenty of times. But, I’ve also seen some sites with great ranks despite a technical SEO mess. And if Google has their way, good technical on and off site SEO won’t be a stand alone ranking achiever in the future. Great summary. I too have found SEMRush to be one of my primary keyword research tools of choice and use a similar process. Once you have the final list from your process, you can drop those into other tools in order to efficiently prioritize. Not sure if you noticed it or if it was just me, but after Google moved to 100% (not provided), it seemed that SEMRush was flaky for a few weeks and didn’t return the same amount of data. There shouldn’t have been a connection, so it must have been a coincidence – worried me temporarily though. I agree that people who run AdWords campaigns will increase their bidding for keywords that convert well. This idea of reverse engineering their campaigns is really smart. Thank you. Do you have any thoughts about a related problem regarding sites that run AdSense? I’ve heard people say that organic traffic from some keywords brings high CTR visitors, but other keywords bring low CTR visitors. I’ve heard that there seems to be no pattern or way to predict this, and the best advice is to simply wait until you find a high CTR keyword (lots of people click on the ads) and then to make more sites or pages based on similar keywords, hoping they too will bring visitors that like to click AdSense ads. Do you think there are any good ways to do keyword research that include getting any estimate or prediction of which keywords will be most likely to bring in organic visitors that will have a high CTR on AdSense ads? Just read your about page, that pic with the pool table looks hot. Lightbulb moment: I should start my own public SEO Blog so I can get fan mail from cute girls. Love love love love love this post, but I have 2 questions. First, how do you handle multiple competitors? Do you run them all at once, or sequentially? Second, why use SEMRush? 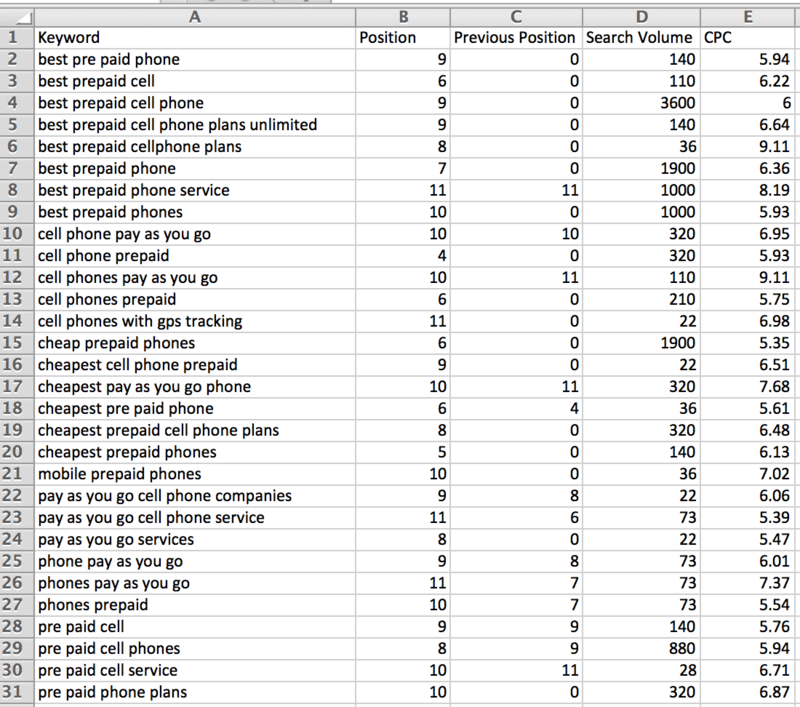 Couldn’t you pull CPC data from Google Keyword Planner and come up with more or less the same money keywords? To answer your first question, I run them one by one. Then you can combine results and remove the duplicates in Excel. Funnily enough, someone asked a question almost identical last night, and I included some examples in my reply that compared results on some terms in SEMRush, GKP and actual analytics.